Schluchsee used to be a scenic village in the Black Forest in south-western Germany. The municipality has 2600 inhabitants and consists of the core village on the shore of the Lake Schluchsee and several other very small and widespread villages. In the Black Forest there are various cases of towns and lakes with the same name being understood as a close cultural unit. This strong bond in the case of Schluchsee is deepened in the early 20's when tourism began in the area and resulted in big economic benefits to the village. For 10 - 15 years Schluchsee was one of the biggest tourist destinations in the Black Forest but the urban development planning which was initiated because of this success committed severe mistakes, that made the village loose much of its identity and so generated huge losses in tourists and therefore resulted in an economic and structural deterioration. The main problem is the nearly complete loss of direct connections to the lake, formerly one of the most characteristic features of the village and condition for leisure activities related to the lake improving its liveability and attractiveness for tourists. A road of regional importance and a railway where built parallel directly on the lakeshore in order to improve the traffic connection of the village with Freiburg, cutting almost all the existing pedestrian connections from the village to the lake. These two new transport axes created an almost impermeable barrier between the village and the lake. 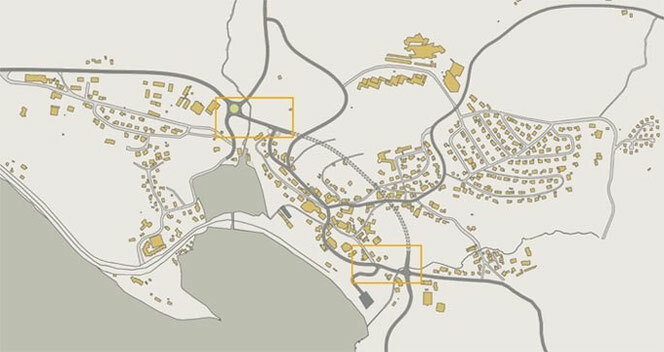 Our project proposes two major interventions in the transport system of the village. On one hand it presents a tunnel passing under the village liberating the lakeside. To access this tunnel we propose two new urban links. Additionally we consider changing the nature of regional rail to a light-rail integrated in the urban structure with the possibility of walking across the tracks in several places. It also suggests a walkway on the shore of the lake and a ferry connection to the north shore. The proposals intend to initiate a new urban development in order to reopen the nucleus to the lake integrating and taking advantage of the extraordinary natural and scenic quality of the Bay of Schluchsee.